1. In the top menu, select File > Export > Soundtrack. The Export Soundtracks dialog box opens. 2. In the Output section, click on the Browse button to select where you want to save the exported sound file. 3. In the Export Range section, enable the All option if you want to export the sound over all the frames of your scene, or enable the Frames option and set the start and end frames in the corresponding fields on the right hand side. 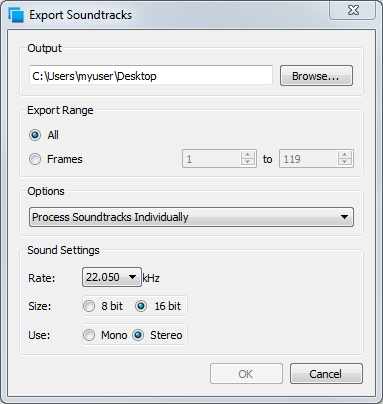 ‣ Process Soundtracks Individually: Select this option if want each soundtrack from all layers to be exported as individual files. ‣ Merge all Soundtracks: Select this option if you want Harmony to create one single sound file combining all the sound files you imported in your scene. Note that it will only use the sound files used in the selected frame range set in the Export Range section. If you selected to export all the frames, all the sound files will be processed. 5. In the Sound Settings section, set the Rate, Size and Use parameters for the soundtracks to export. It is a good idea to verify what is required by the software, or device, that you might next want to use the sound file with. 6. Click on the OK button to export your sound file. The generated sound files appear in the selected directory and are named according to the scene name. Individual files will keep their original name; only a prefix matching the scene name is added.